Bodhgaya, Bihar, India – This morning the weather was still cold and grey as His Holiness the Dalai Lama drove from the Tibetan Temple to the Kalachakra Maidan. He responded to many people’s greetings as he walked from the car and saluted the crowd from the front of the stage before taking his seat on the throne. Adult members of the Nalanda Shiksha recited the ‘Mangala Sutta’ in Pali and children from the local Maitreya School eloquently chanted the ‘Heart Sutra’ in Sanskrit. The Nalanda Shiksha group attending these teachings in Bodhgaya number about 2000. They include 300 college students from Delhi, Chandigarh and Jammu, 200 from Buddhist communities in Sankisa, 600 local students from Bodhgaya and other people from Jammu & Kashmir, Himachal Pradesh, Uttar Pradesh, Goa, Andhra Pradesh, Tamil Nadu, Karnataka, Sikkim and Odisha. 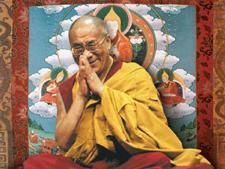 For their benefit His Holiness’s words are being translated into Hindi. There are also 3000 foreigners in attendance hailing from 69 different countries. For them simultaneous translation of what His Holiness is saying in Tibetan is being broadcast over FM in English, Hindi, Russian, Mongolian, French, Chinese, Korean, Vietnamese, Japanese and Spanish. There are also broadcasts in Central Tibetan, Amdo and Khampa dialects. “We have all gathered here, some from far away, because we all want to be happy and to avoid suffering,” His Holiness told the audience. “This is true even of insects. We don’t need to apply reason to understand it; we can just see it for ourselves. What we do need to use reason for is to evaluate the advantages and disadvantages of concern for others and self-centredness. Scientists say that basic human nature is compassionate. It isn’t a matter of religious practice so much as a recognition that just as you appreciate it when others show you affection and compassion, others appreciate being treated the same way too. It’s a matter of training the mind. Confusion is present in them all. Although things appear to exist inherently, when they are examined and analysed, no trace of inherent existence can be found, because they are dependent on other factors. Are only names, space too is only a name. Without the elements how could forms exist? Comes certain knowledge which completely destroys all modes of mental grasping. At that time the analysis of the profound view is complete. 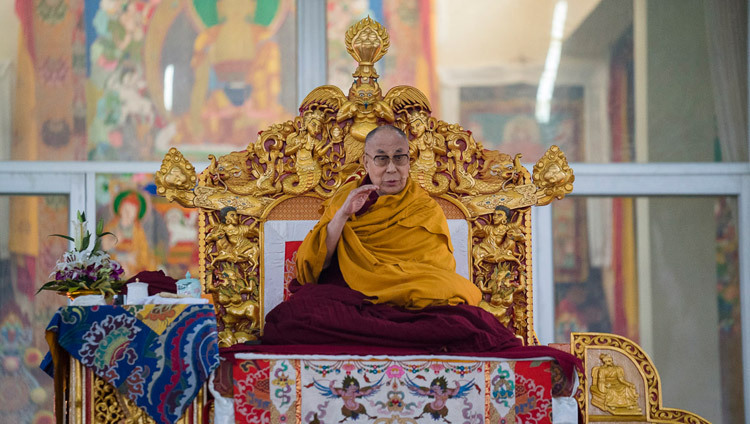 His Holiness announced that he will begin tomorrow’s session by conducting a ceremony for generating the awakening mind of bodhichitta, followed by the transmission of certain mantras. He will then complete his reading of the Rice Seedling Sutra. The Honourable Chief Minister of Bihar, Sri Nitish Kumar will then come and take part in the release of the first English volume of a groundbreaking series entitled, ‘Science and Philosophy in the Indian Buddhist Classics’.